Curb appeal is your home’s fashion and beauty routine. We all know it’s what’s on the inside that matters, but being beautiful on the outside is always nice too. It’s not only materialistic, though. Curb appeal is about more than just good looks, it is also your home’s first impression to a prospective buyer. One study from Harvard found just how important, and permanent, a first impression really is. First, 55% of a first impression is visual. 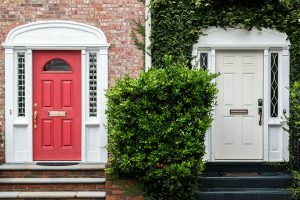 If you want visitors, and even more importantly, potential buyers to think highly of and seriously consider purchasing your home, then curb appeal is key. Second, first impressions happen in only seven seconds. No one is going to make it into your house from their car in that time. Their entire first impression will be based solely on your home’s exterior curb appeal. And finally, studies have found that a first impression takes seven more opposite interactions to change. Potential buyers only visit once, though, so their first impression based on your home’s curb appeal is permanent. Once a potential buyer forms their first impression, it won’t change, and that’s why good curb appeal is vital when selling your home. A better first impression means more interest, more bids, and more money for you in the final sale. So, what are some things you can do today to achieve stellar curb appeal? No matter what your budget is, The Degnan Group has plenty of ideas to get you started! You see your garage and front door every day, so it’s hard to notice the slow wear and tear that weather has had on it. A fresh coat of paint will cover up any flakes and faded areas that have emerged. It’s also a chance to try a completely new color and look for the year, all for the cost of only one or two cans of paint. Head over to your local nursery to buy a tree. They’re easy to care for and hardly take a green thumb. Trees are an investment that keeps on giving. If you’re not planning to sell, you’ll be able to watch it grow right before your eyes and increase your home’s property value as it does. If you’re not interested in buying a new tree, consider creating and planting a new small garden, or installing window boxes and hanging plants on your windows and porch. Let your inner HGTV star out with this easy option. In the fall, put out a scarecrow, bale of hay, or some pumpkins and gourds. In the summer, hang a flag, and in the winter, go all out with the holiday lights. A decorated house is a happy house, and a fun way to flex your design muscles and keep your home looking fresh and up to date with the seasons. Chances are, you haven’t given your mailbox a second thought. It’s weathered, it’s aged, it might even be dented. Buy a new one at your local home repair store and be amazed at how this little change can go a long way in improving your home’s curb appeal. If you have the funds, consider hiring a professional to redo your yard and gardens. They can trim the trees and bushes, build new gardens, re-mulch your flower beds, and so much more while you enjoy the increased curb appeal from the comfort of your own home. Just like painting your front and garage doors helps your home look fresh, a new layer of paint on your shutters goes a long way. Local painters or contractors are always available to tackle this task in a day or two. Install new porch lights, a street lamp, a new fountain, arbor, railing, or fence. Or, consider replacing your outdoor furniture on a porch or deck. The list goes on. Spend a couple days brainstorming, then take on this project in a single weekend to drastically improve your home’s curb appeal with a little outdoor decor. Sometimes the wood starts rotting on a door or frame, and the locks get compromised from too much use. If that’s the case, it’s time to replace your door entirely. When you do so, consider also replacing the surrounding wood, windows, and even adding some new molding to give it some extra flair. This option is expensive, but it’s also practical. Warped or missing shingles are not only an eyesore, they can also lead to leaks and expensive damages. Invest in replacing your roof, and your home’s property value will go way up. Cracks, bumps, and stains are all common in outdoor areas, and your driveway is no different. However, if it’s time to sell your home, consider replacing your driveway with brand new concrete. You can even add an extra parking space on the side to increase your home’s value even more. A fresh coat of paint is like a total makeover. It’s not cheap, but your curb appeal will go through the roof when potential buyers see bright, clean siding right when they pull up. Talk about powerful first impressions! Our final option adds curb appeal as well as serious value to your home. Brand new windows can lower your energy bill if you’re not planning to sell, and increase your home’s curb appeal if you are. Win-win. When it comes to selling your home, it’s clear that curb appeal is key. That’s why choosing The Degnan Group as your listing agent is the perfect first step in your selling process. We not only walk you through the listing and selling process, we will also help you create your home’s online portfolio featuring beautiful photos of the exterior and interior. That way, potential buyers will always have a perfect first impression, and bids will be piling up in no time. Are you ready to sell? Complete some of these projects to get stellar curb appeal, and call The Degnan Group to get your home listed today!